Democracy? We don’t need no stinkin’ democracy! Greetings from Loony Massachusetts, the second goofiest state in the country! This one has me really riled up! It may seem at first like a local issue, but it is already happening in other parts of the country. The implications here are ominous, not just for smokers, but for the very concept of representative democracy. 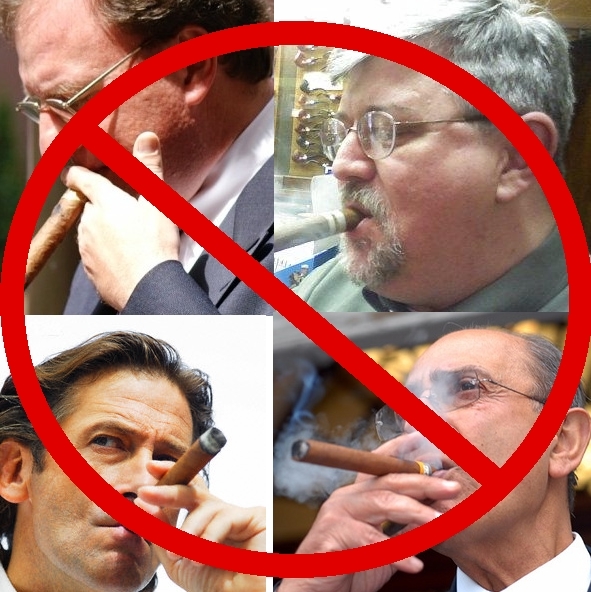 They did not offer any rationale for the closing of the few remaining cigar bars in the city. But then, they didn’t really have to, did they?. The Public Health Commission doesn’t like smoking. THAT’S the rationale. The sad truth is, in this city, they don’t need any other. What I find more disturbing about this than anything is that a handful of non-elected bureaucrats believe that it is up to them to decide what the “mission” of a private business should be. What is genuinely troubling here is that the Boston Public Health Commission is answerable to NO ONE except the Mayor. They do NOT answer to the City Council, and therefore, by extension, they are not answerable to the people. They have complete autonomy to pass whatever laws they wish irrespective of the wishes of the people. Of course, they call them “regulations” rather than laws, but what’s the difference, really? The head of the Commission is for all practical purposes a dictator when it comes to any matter that she perceives to be a matter of public health. And yet these non-elected bureaucrats, who make no effort at all to hide their anti-tobacco agenda, are in a position to dictate that a private business cannot sell tobacco, even though tobacco is a completely legal product that is, by the way, still enjoyed by millions of people. Their pitch that selling tobacco is incompatible with the “mission” of drugstores is nothing more than a red herring. Drug stores nowadays are, for all intents and purposes, glorified convenience stores. You can buy many, many things at a drug store that have nothing to do with medicine. In fact, you can buy a lot of things there that are quite bad for your health, such as candy, junk food, and tonic (what the rest of the world outside Boston calls soda pop). So is the Public Health Commission proposing banning the sale of those things in drug stores and college campuses? No, of course not. This alone demonstrates the utter hypocrisy of the Commission regarding this issue. This is NOT about improving public health. That goal was achieved several years ago when Boston, and in fact the entire Commonwealth of Massachusetts, passed laws making it illegal to smoke indoors, with only private homes and cigar bars as the exception. Massachusetts is 99.9% smoke free. The public is in no danger from second hand smoke (not that they ever were in the first place). This brings me to my next point. What I find even more disturbing in this article is the Commission’s stated goal of closing cigar bars within five years. It is unthinkable that in a free society that non-elected officials can, on a whim, CLOSE DOWN NOT JUST A BUSINESS, BUT AN ENTIRE INDUSTRY THAT IS SELLING A LEGAL PRODUCT!!!! Sorry, didn’t mean to shout there, but this one makes me truly angry! They claim to be concerned about the health of the employees, but this is ineffable rubbish. Employees who work in cigar bars are almost ALWAYS cigar smokers themselves who not only were aware that smoking was allowed in these places, but in fact sought employment there for that very reason! If the Public Health Commission is truly so concerned about the welfare of these employees, it should reconsider its decision to throw those employees out of work. What this is about is no less than Prohibition through the back door. As things stand now, there is certainly no shortage of smoke free bars in Boston, for the simple reason that they’re ALL smoke free. So why can’t there be a few places where people who enjoy smoking (and there are many, many of us still out there) can do so? I can think of no rational reason to eliminate the city’s three or four remaining cigars bars except anti-smoking zealotry. A handful of anti-tobacco zealots, not satisfied with banning smoking in bars, restaurants, and workplaces throughout the city, want to stamp out smoking altogether–under the now disingenuous pretext of “public health”– by outlawing the last few places where people who like to smoke can do so in a welcoming environment, while not in any way inconveniencing non-smokers. But the real danger in all of this is not the further harassment of smokers here in Boston, although that certainly is an issue here. What is happening here is nothing less than the erosion of representative government. As I stated before, the Public Health Commission does not answer to the City Council. What this means is that I can get on the phone and talk to my city councilor until I’m blue in the face, and even if he or she happens to agree with me, the councilor cannot do anything. This is not how representative democracy is supposed to work. When a handful of appointed bureaucrats can trump the power of the people’s elected representatives, then democracy begins to die a slow death. This may not generate a lot of ire in the populace, simply because, once again, it’s only the smokers who are getting shafted, and no one really cares about what smokers want, right? But just remember, if a handful of non-elected bureaucrats can take away my rights today, they can take away your rights tomorrow. Now that I’ve gotten that out of my system, I’m off to smoke a cigar in the privacy of my own home. While I am still allowed to by the Public Health Commission, that is.